A day-long activation of the entire corridor that focuses on pedestrian, cyclist, and public space enhancements. This partnership between Multicultural Communities for Mobility (a project of Community Partners), From Lot to Spot and CALO YouthBuild seeks to engage the community of Boyle Heights in envisioning what Cesar Chavez Avenue could be and should be for everyone - residents, business owners and patrons, cyclists, pedestrians, drivers, people and families of all ages. 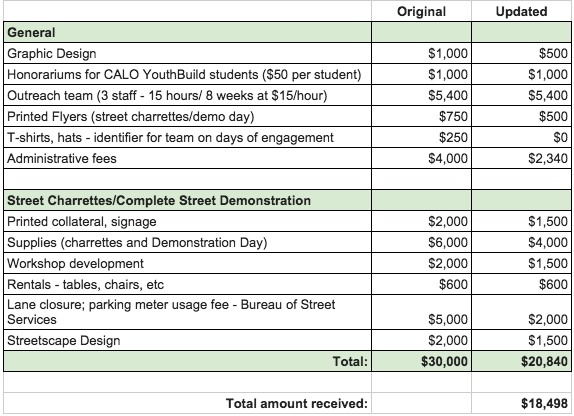 Through a series of sidewalk charettes, we will utilize hands on materials to visualize the possible configurations for pedestrian, transit, and bicycle infrastructure as well as identify better uses for vacant spaces in the corridor. This will culminate in a day-long activation that demonstrates the community's shared vision for Cesar Chavez Ave. Conduct demonstration and celebrate with the community! Highlight the existing and potential pedestrian and cycling activity in the community to change people’s perception of their public space, promote community pride, and boost the local economy. Exhibit and educate the community about road design treatments that can improve the safety of pedestrian, cyclists and transit riders. Promote the Great Street corridor and solicit community feedback for ideas to improve and activate the segment. All costs taken from prior MCM experience in similar events.